New York City's 'People's Opera' May Face Its Final Curtain : Deceptive Cadence The New York City Opera, nicknamed the "people's opera" by Mayor Fiorello LaGuardia when it was founded 70 years ago, has always been a low-cost alternative to the more upscale Metropolitan Opera. The company may have to cancel its upcoming season if fundraising falls short. 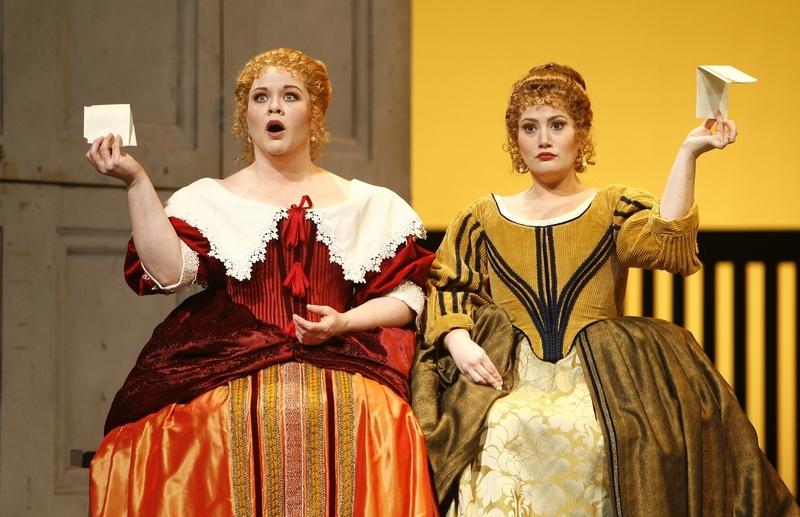 Pamela Armstrong (left) as Alice Ford and Heather Johnson as Meg Page in New York City Opera's production of Falstaff. The so called people's opera may have to cancel its upcoming season if fundraising falls short. There are a lot of operas that end with heroines on their deathbeds, singing one glorious aria before they die. That's what happens at the end of Anna Nicole, the controversial new work that New York City Opera is presenting at the Brooklyn Academy of Music in September. But the company's artistic director and general manager, George Steel, says it could also be City Opera's last gasp. "The issue is this: We don't have any credit, we don't have any working capital, and so we are managing our cash incredibly carefully," Steel explains. "It doesn't take much to knock us off our game; we're so vulnerable." The U.S. premiere of Anna Nicole is set to open at the Brooklyn Academy of Music — BAM — on Sept. 17. Above, a 2011 performance of Anna Nicole at the Royal Opera House in London. The New York City Opera, nicknamed the "people's opera" by Mayor Fiorello LaGuardia when it was founded 70 years ago, has always been a low-cost alternative to the more upscale Metropolitan Opera, a place where music lovers could discover new American voices — like Beverly Sills — and see fresh, innovative productions. But more recently, the company has fallen on hard times. On Sunday, City Opera announced that if it doesn't raise $7 million by the end of September, the rest of this season's performances will be canceled. When Steel took over City Opera in 2009, the company was already in dire straits — a series of board and management decisions had seen the endowment shrink, and an entire season was lost while City Opera's Lincoln Center theater was being renovated. Steel presented a couple of short seasons at the arts complex, then made the controversial but cost-cutting decision to leave and perform in different venues around New York. The idea of the nomadic company going from neighborhood to neighborhood was an intriguing idea. It was interesting, but it also seemed like [it was] potentially full of ... problems and challenges, in that there would be no identity, no stability. "Leaving Lincoln Center is a part of what makes it tough to raise money, but also, leaving Lincoln Center saved our lives," Steel says. "If we were still at Lincoln Center, we would've closed. We save over, probably, $5 [million] or $6 million a year by not being there." Anthony Tommasini, chief music critic of The New York Times, says the results have been mixed. "The idea of the nomadic company going from neighborhood to neighborhood was an intriguing idea," Tommasini says. "It was interesting, but it also seemed like [it was] potentially full of ... problems and challenges, in that there would be no identity, no stability. But the actual work that George Steel has produced has been quite good." Just to get through this season, the company needs to raise $7 million. And to present next season, it needs to raise an additional $13 million. "We're shocked and angry and sad," says Gail Kruvand, who has played bass in the orchestra for 22 years. She says the musicians found out about the cash crisis via email and that the orchestra committee is demanding Steel's resignation. Will The Show Go On At New York City Opera? "We've experienced it; the new model, the 'sustainable' model for the New York City Opera that, apparently isn't sustainable," Kruvand says. "We're looking at this season, 22 performances. We used to do 122 at Lincoln Center. It's so diminished in size and, you know, also in stature right now." 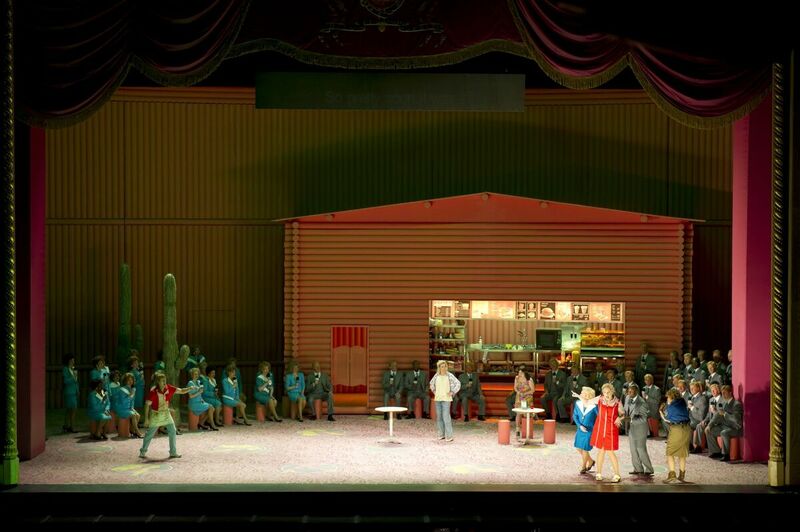 Tommasini hopes an angel can come along and save the company. "I'm looking forward to Anna Nicole and I certainly, certainly hope it's not the last production that the New York City Opera presents," he says. New York City Opera has begun a Kickstarter campaign to raise $1 million from the company's fans by the end of the month. As of Tuesday afternoon, only about $55,000 had been pledged.